ViewSonic Corp. is now shipping the CDE7060T, its new 70-inch, 10-point touch interactive commercial display. This large-format display is designed for stimulating interactive learning in classrooms and collaborative brainstorming in boardrooms. With a 10-point, touch-enabled surface and pre-installed annotation software, the CDE7060T allows multiple users — from students and teachers to boardroom professionals — the ability to write, draw or annotate with fingers or stylus devices simultaneously. The LED-based display features native 1080p (1920x1080) resolution for HD color and clarity, while the embedded ARM dual-core processor provides quick computing and smooth touch capabilities. 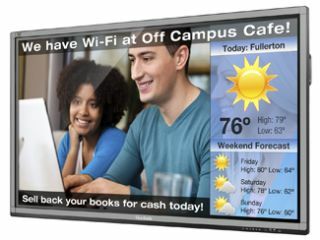 "Interactive displays have become the definitive tool for classrooms and corporate boardrooms," said Gene Ornstead, director of product marketing at ViewSonic. "Enabling end-users to easily access and integrate materials such as videos, computer applications, and web-based media content increases audience engagement and ultimately improves results." For flexible connectivity, the CDE7060T includes HDMI, VGA, USB, LAN, and RS232 support. An optional slot-in PC provides additional computing power, while integrated ViewBoard software delivers robust annotation options that make presentations more productive and engaging. The ViewSonic CDE7060T 70-inch, 10-point touch interactive commercial display is available now at an MSRP of $7,299.